The Miles M.11 Whitney Straight was a two-seater light aircraft with a dual-control, 'side-by-side' cockpit configuration developed in 1936 as a collaboration between Miles Aircraft and American-born Whitney Straight, best known as a Grand Prix motor racing driver and later a Royal Air Force pilot and director of British Overseas Airways Corporation. The intention was to provide a more comfortable and social experience than the then-common tandem open cockpit designs. First flown on 14 May 1936, the M.11 was intended to provide a low-powered and economical aircraft suitable for civil operation by flying enthusiasts. A total of 50 M.11A and M.11B Whitney Straights were built in two years of production. The most common was the M.11A, powered by a 130 hp (97 kW) de Havilland Gipsy Major I while the M.11B was powered by a 135 hp (101 kW) Amherst Villiers Maya I, adding 10 mph (16 km/h) to its maximum speed and 200 ft/min (60 m/min) to its rate of climb. A single M.11C prototype, fitted with a 145 hp (108 kW) de Havilland Gipsy Major II engine and variable-pitch propeller, was tested. It crashed at Harefield, Berkshire on 28 June 1938, killing the test pilot, Wing Commander F.W. Stent. Modified Whitney Straights were also used as engine test beds and by Miles to test different flap designs. At the outbreak of World War II the Royal Air Force impressed 23 Whitney Straights for use as communications aircraft. Twenty-one of these served in the UK, one in India and one in Egypt. One M.11A also served with the Fleet Air Arm from 1940 to 1943 and three with the Royal New Zealand Air Force. 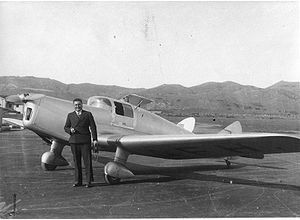 Between 1939 and 1943, a New Zealand machine piloted by Alan Pritchard was used for aerial seed sowing trials at Ninety Mile Beach and later spreading superphosphate. These trials were part of the experiments which lead to the development of aerial topdressing, (see also Agricultural aircraft). Mount Cook Airline - One aircraft only. G-AFGK at the Reynolds-Alberta Museum, Wetaskiwin, Alberta. Miles Whitney Straight Pictures and Miles Whitney Straight for Sale.